Tabs are custom buttons that users can create in the ExpressionEngine control panel Main Menu Manager. They're very useful, but have some limitations. Tabs are unique for each member. It is time consuming for administrators to create the same tab for a number of members. When new members are registered in the future you have to manually create those tabs for them again. This extension allows you to create navigation tabs for entire member groups in the ExpressionEngine control panel. All existing and future members will have access to the tabs you create for their member group. In the ExpressionEngine control panel navigate to Add-Ons > Extensions and click Member Group Tabs 'Settings'. The Member Group Tabs settings page will list member groups that have control panel permissions. 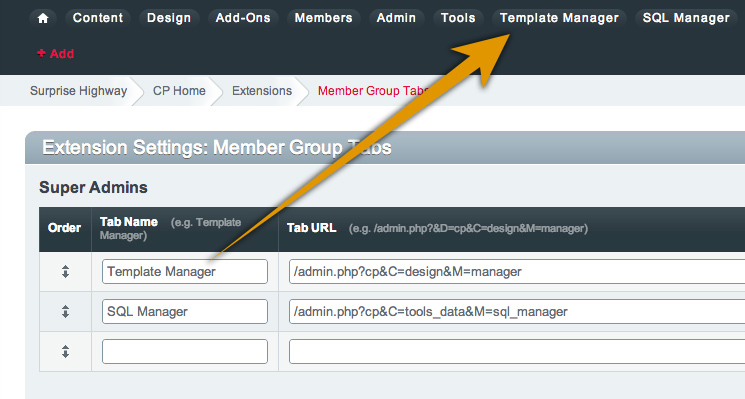 Created member group tabs will appear in-between ExpressionEngine's default buttons, and the default member tabs. Tabs can be rearranged by selecting, and dragging up or down. The 'Tab URL' field can contain a relative or absolute URL. External URLs are automatically masked to protect the location of your system path from server logs. This is a free add-on, but we'll support it as best we can. Report any issues on the ExpressionEngine Answers forum. If you have a feature request or question that's not appropriate for the forum, email hello@surprisehighway.com. Twitter Mail RSS Page loaded in 0.3957 seconds. We love performance.